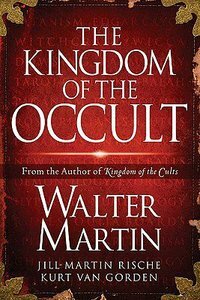 This book takes Dr. Walter Martin's comprehensive knowledge and his dynamic teaching style and forges a strong weapon against the world of the Occult-a weapon of the same scope and power as his phenomenal thirty-five year bestseller, The Kingdom of the Cults (over 875,000 sold). Chapters include: Witchcraft and Wicca, Satanism, Pagan Religions, Tools of the Occult, Demon Possession and Exorcism, Spiritual Warfare, etc. About "The Kingdom of the Occult"
Martin heald four earned degrees, have received his doctorate from California Coast University in the field of Comparative Religions. Kurt Van Gordon, formerly a pastor in Utah, is the director of Jude 3 Missions and the Utah Gospel Mission, founded as a mission to cults in 1898. Customer Reviews For "The Kingdom of the Occult"
This is an excellent book. Very informative and full of information on a wide range of occultic practices, recommended to every christian, especially those that havnt delt with with satanism at all.